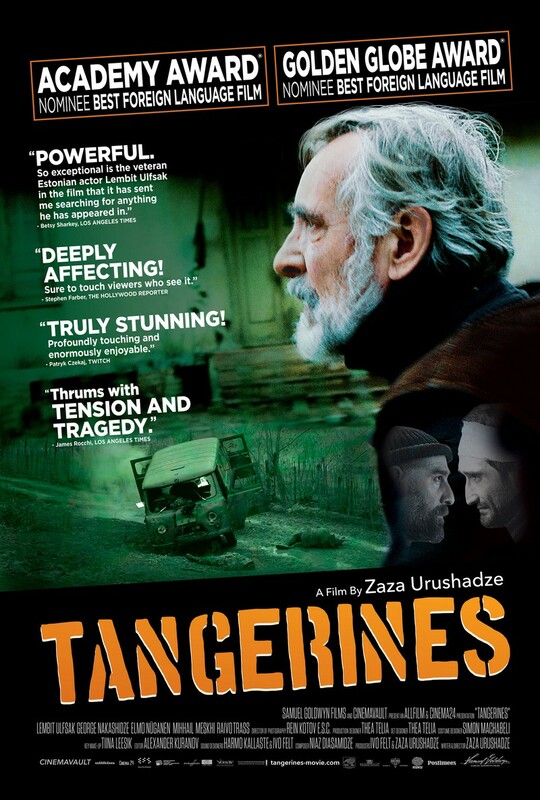 Set in Georgia in 1990 during the war, this quiet, powerful film tells the story of Iwo (Lembit Ulfsak), an Estonian man who has stayed behind in the region to harvest his crop of tangerines, and his neighbor, Juhan (Raivo Trass), also a tangerine farmer. The Georgian civil war has forced the rest of the locals to flee back to Estonia for safety in this tumultuous time. After a bloody battle ensues nearby, Iwo takes in a Chechen soldier, Ahmed (Giorgi Nakashidze), a Muslim, and a Georgian soldier, Niko (Misha Meskhi), a Christian, who were both injured in the battle. These two sworn enemies promise not to kill each other as long as they are in Iwo’s house. Their performances are rooted in a palpable history. This anti-war film leans towards the things that connect us as opposed to the those that separate us. What it has to say about current conditions between various religious factions all over the world is incredibly pertinent. Sit two humans next to each other and have them discover their commonalities and before long a bond can be formed. Zara Urushadze directs this film with a quiet intimacy and humanity that is rarely seen in a war film. This is not strictly a war movie, merely a story set during a violent time in Georgia’s recent history. The quietness is its greatest strength, nominated for Best Foreign Language Film at the Oscars (2015) and losing out to Pawel Pawlikowski’s ‘Ida’, it is well deserving of acclaim and worth seeking out. This is a film that many will not see and more’s the shame; it’s Georgian, subtitled, has very little in the way of action but is more powerful and important than a hundred studio movies put together; it is a deep, moving, anti-war film underpins the drama with the unsettling threat of battle always round the corner. I want to see more of these; well-made, intelligent films that tackle serious subjects with subtlety and sensitivity.